This is another easy tip to wrap up this series of articles. Start your application and unplug your mouse. Can you navigate and use your application? If you hit the tab key does the next logical control get focused? Can you open the file menu by pressing Alt-F? 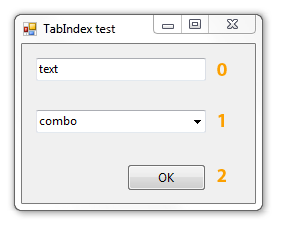 Simply set the “TabIndex” property of your controls in ascending starting with 0. This way when your users press the tab key they next focused control is the next control in the flow of your form. To add “quick key” ability to your menus you just need to put an ampersand (“&”) before the letter that will be used for quick access. For example, instead of a menu item captioned “File”, caption it “&File” instead. Now your users can access that menu quickly by pressing Alt-F. In Windows Vista Microsoft changed the buttons, radio buttons, and checkboxes to have subtle animations. When you hover, check, and click these controls they all yield organic animations. But if you built your app using Windows Forms the subtle animations aren’t there. To add these animations all you have to do is set the “FlatStyle” of these controls to “System”. Microsoft has assembled a great collection of guidelines for designing applications. It’s filled with screenshot examples showing good & bad designs. Plus it’s surprising self deprecating – some of their examples of bad design are screenshots taken directly from Microsoft apps. You should skim the guide at least once and bookmark it for later. That’s it for the series. If you missed the earlier articles you can see the full list of articles in the series. Though I have a problem with setting the property FlatStyle to System for Buttons. It seems that those Buttons don’t support images anymore. Do you have a solution to this problem? Unfortunately the Windows Forms controls don’t handle images automatically when the FlatStyle is set to System. There is a solution, though. It involves using the “BCM_SETIMAGELIST” message sent to button. This article covers it pretty well. The example code uses the BCM_SETIMAGELIST API to set images to buttons with “System” FlatStyle. Here’s a slightly better example. Wyatt – thanks for these great tips. I’m working on giving my application a Windows 7 makeover and this is very helpful. Thanks for the help and resource!